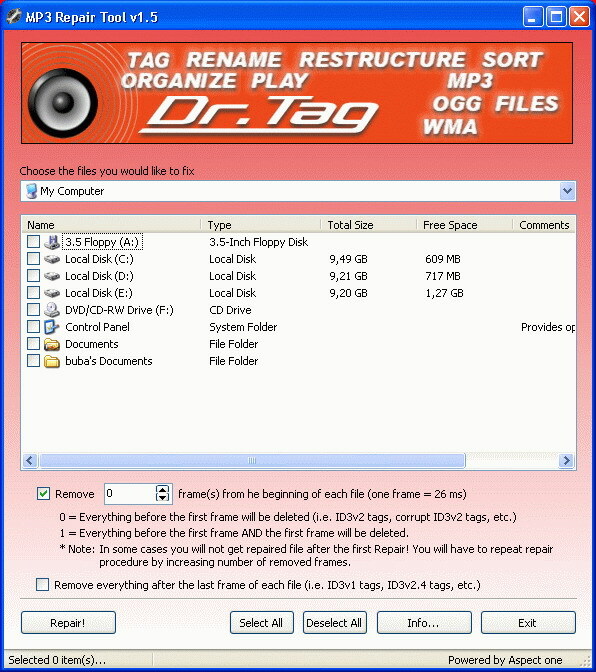 MP3 Repair Tool can cut the corrupt beginning or remove corrupted tag from the end of the MP3 file. Audio information consist of single frames, each 26 milliseconds long. It enables you to delete the whole beginning of the file including a few frames to ensure that the whole corrupt header has been cleaned. I had an album on my laptop that would play on Winamp so I thought everything was fine. When I transferred that album to my desktop it wouldn't play in WMP or VLC. 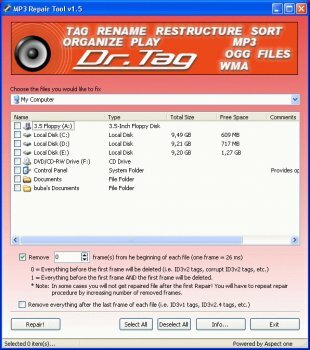 I didn't want to download Winamp as I wanted to make sure these mp3's would play on other computers without Winamp. So, I downloaded this and used the default settings, low and behold the mp3's play in WMP now. I'm rating this program a 4 for now because the songs still show up as being 18 minutes long when in reality they aren't.